Consumers are more confident about the labour market, but less so about their own futures, new research shows. 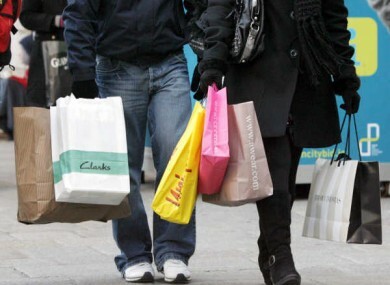 CONSUMER SENTIMENT surged in May, according to the latest data compile by KBC Bank and the national economic think-tank the ESRI. The Consumer Sentiment Index grew to 59.4 in May, up by 1.5 points from just a month earlier, dragging the three-month average up to 55.9. Figures above 50 are generally interpreted as a sign of positive growth in the economy; the index stood at below that threshold just four months ago. The index currently stands far lower than it did at this time last year – when in May 2010 it stood at 65.3, with a three-month average of 64.3 – but the rise does indicate that consumers are becoming more confident about the financial affairs of the State. The index of consumer expectation – which comprises half of the CSI value – surged to 50.8 from 42.3 last month, primarily reflecting a more positive perception of the labour market. Conversely, though, consumers’ perception of their own situations has fallen. The value of that index fell to 72.1 last month from 81.0 in April. Hughes said it was important that the index showed how “the extreme fears that became widespread in late 2010 continue to fade”. Email “Positive consumer sentiment surged in May - ESRI”. Feedback on “Positive consumer sentiment surged in May - ESRI”.